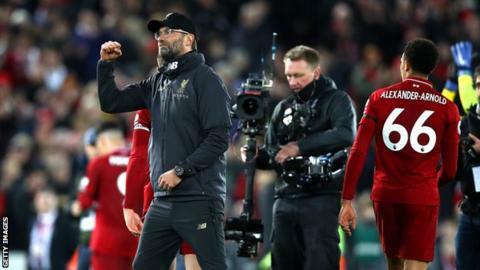 Liverpool boss Jurgen Klopp said it would be “crazy” for the club’s fans not to be enjoying their nine-point lead in the Premier League – but played down his side’s title chances. The Reds beat Arsenal 5-1 at Anfield on Saturday to move further clear. “I’m not the smartest person in the world but I’m really not an idiot – not always at least,” Klopp said. Liverpool were helped by second-placed Tottenham’s home defeat by Wolves, before a hat-trick from Roberto Firmino and goals from Sadio Mane and Mohamed Salah gave them victory over Spurs’ north London rivals. Champions Manchester City, who Liverpool meet in their next game on 3 January, could cut the gap to seven points by beating Southampton on Sunday, but Liverpool are guaranteed to finish 2018 top of the table. The Reds are chasing a 19th English top-flight title but their first since 1990. But the German acknowledged that “if the fans are not in a good moment it would be crazy”. “Maybe New Year’s Eve will be a bit louder – maybe not too loud, my dog doesn’t like it. Enjoy it but be ready again 3 January. “If we drop three points, you [the media] will be the first to say that we’re nervous. We can’t play that game and we won’t do it. “At the moment it’s a marathon that we’re running. Klopp said his players were aware of Spurs’ defeat before they kicked off against Arsenal but said his side were “completely focused” on their own fixture. “I didn’t see a smile on any faces in the dressing room,” he said. “Now it’s not about creating headlines, but about playing football matches as well as you can and picking up more points, which we will try and do as best we can.